When it comes to reaching a wide audience, there’s no wider net to cast than pop culture. With 24/7 news and non-stop social media, there’s no escaping the latest celebrity shenanigans, sports fiascos, fashion trends and whatever else is trending that day. Some brands have learned how to draw attention to themselves by “newsjacking”: jumping on trending topics or incorporating pop culture references into their social media strategy. But how well does this strategy work? Here are three ways brands have successfully integrated pop culture into their content and how other brands can do it, too. 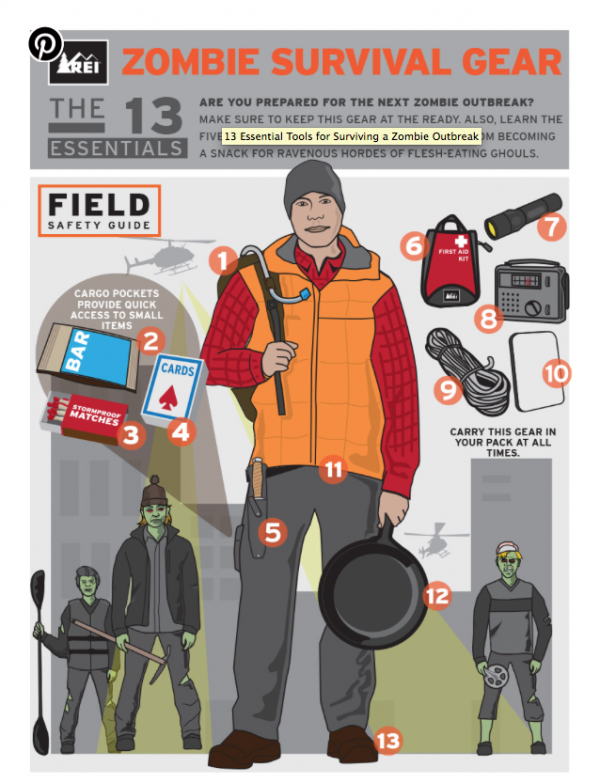 Thanks to AMC’s The Walking Dead, zombies are everywhere, and brands like REI saw this as an opportunity to capitalize on the allure of the undead. The outdoor clothing and gear company created an infographic of 13 essentials—all REI products—needed to survive a zombie outbreak. It was a hit, being picked up for use by other sites, which helped expand REI’s influence. It was a pop culture reference that was fun, relevant and interesting to customers. It reinforced REI’s relationship with the consumer by providing them with content that was relevant to the brand and valuable to zombie-loving consumers. It showed the value of REI products without making it feel like a sales pitch. Before the NWA biopic, Straight Outta Compton, released in August, the brand created a meme generator that has led to more than 266,000 Instagram posts hash tagged with #StraightOutta. The black-and-white images display a logo with “Straight Outta [insert hometown or clever line].” Unmetric tracked top brands, like Pabst Blue Ribbon, Insomnia Cookies and Power Rangers, that capitalized on the #StraightOutta memes. The debut of the movie was so well publicized and highly anticipated that the meme was easily recognizable to most audiences. Memes are fun, easy to create and very shareable, which means audiences are sharing your brand when they share the meme. Responding with your own clever, creative content makes you memorable to your consumers. These tweets engage the audience on a personal level, almost like you’re cracking jokes with a friend. Engaging audiences in non-traditional ways like using social media to comment on hot topics is risky, but it can be rewarding when you appeal to their interests, needs or sense of humor. Bonus points if you can do all three. Millennials like authenticity, and brands that do well are ones that involve themselves in hot topics in an organic way. Millennials can sense when a brand is trying too hard to be relevant. The cleverer and more engaging your brand is, the more “likeable” you become to audiences. When brands and pop culture collide, it can benefit companies in ways that traditional social media campaigns or tactics don’t. But it’s important as a brand to ask: How does this connect to my audience? Are the content, the message and the pop culture reference in harmony? Does this make sense as it relates to my brand’s story? What will the audience take away? The recipe for marrying pop culture and your brand’s initiatives into a successful consumer experience requires finding a personal connection, recognizing relevancy and creating useable content that highlights the value of your products. Doing that, your brand could end up profiting from the unpredictable waves of pop culture.